(Mineola, NY) The Mineola Junior Fire Department recently held their 15th Annual Installation Dinner and Awards Ceremony to honor the officers and members of this fine organization for their dedicated service to the community. Since 1976 the Mineola Junior Fire Department has given young men and women from the community the opportunity to learn about being a volunteer firefighter through training exercises, social activities and participation in actual emergency events. 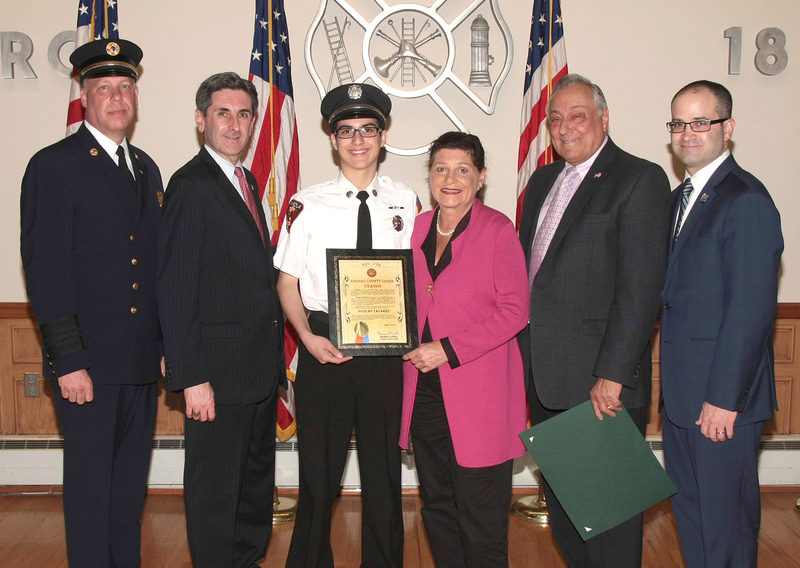 Among the outstanding members, Nicholas Tavares of Mineola was named Junior Firefighter of the Year. Nassau County Clerk Maureen O’Connell and other area officials joined the Junior’s in honoring Nicholas for his great commitment to community service. Clerk O’Connell presented him with a County Citation in recognition of his achievements.